Many children have anxiety about going to the dentist. Whether it is from past experiences, things they have been told, or even if it is their 1st ever visit to the dentist, children can become nervous. We want to do everything we can to make sure you and your child are comfortable and have a great dental experience. McClure Pediatric Dentistry wants your child to want to come to the dentist. Dr. Jon wants to meet all of his patients before they are in the chair, and before he puts on his funny glasses. Sometimes he even brings some magic to the interview as well. During your child’s first visit we will conduct a new patient interview in which we will review medical and dental history so that we do not overlook any potential issues. We will also ask and address any immediate dental concerns you may have. After the interview, we will take some x-rays if necessary. 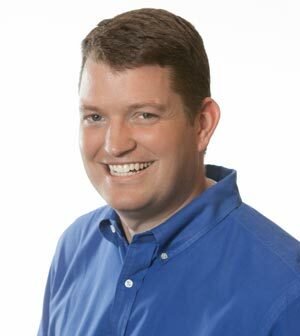 Dr. Jon is committed to giving the best possible care from day one. Not all x-rays are to check for decay. Several x-rays are taken to check for structure as well as development of the mouth and teeth. Many conditions can be treated much easier and less invasively when detected earlier. 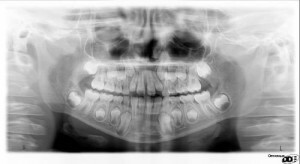 As you can see on this Pano of an 8 year old boy, we can clearly see the teeth present, where they are erupting, and gauge the growing development of this patient. Occasionally, children will be congenitally missing some of their permanent teeth. Sometimes their permanent teeth show an abnormal eruption pattern. Detecting this early can prevent costly consequences. Here, Dr. Jon is looking for what is happening between the teeth where the eyes cannot see it. Depending on age and concerns, there can be anywhere from 2 to 4 Bitewings taken. Some children do not require any x-rays. This decision is patient specific. These are usually taken of the front teeth of patients 3-8 years old. They are not only to look for decay but also to assess the presence and positioning of the unerupted permanent teeth. From the x-ray room, the patient will be seated in a chair where they can watch a movie on the ceiling as Dr. Jon begins the examination. We will be looking for the overall health of the mouth and its development. Then we will clean and polish the teeth before applying the “Tooth Vitamins”in the form of a Fluoride varnish. From here, any further treatment can be discussed and scheduled if need. If no treatment is recommended we will schedule your 6 month cleaning.